Don’t Stop Singing’, a collaboration across the generations between Thea Gilmore and Sandy Denny. Island Records are excited to announce that November 7th heralds the release of an important new album. 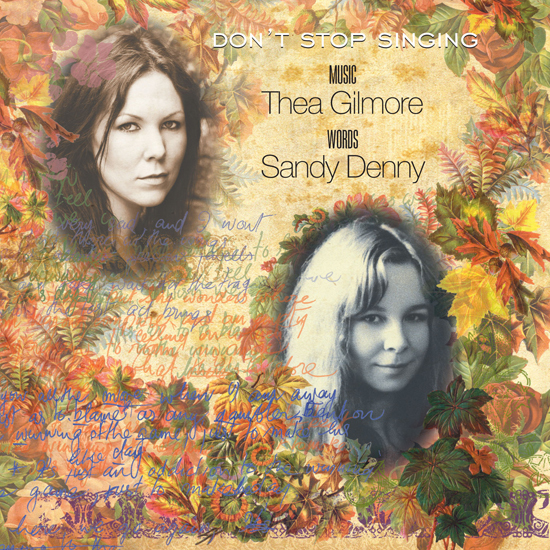 Thea Gilmore and Sandy Denny release Don’t Stop Singing, a collaboration across the generations between Thea and Sandy. In late 2010 Thea Gilmore was commissioned by Sandy’s estate, in conjunction with Island Records, to write melodies for unfinished manuscripts, lyrics without music, and works in progress to finally bring some of Sandy’s last works to the world. Don’t Stop Singing is the result. An album of 10 beautiful songs, Thea’s peerless voice and melodic gifts bring the Denny spirit and vision into the 21st century. The album ranges from the uplifting ‘Glistening Bay’, an epihany rooted in stirring natural imagery borne along by piano and sweeping strings, to the dark personal imagery of ‘Pain In My Heart’ and ‘Long Time Gone’ to the exquisitely fragile lullaby ‘Georgia’… all tied together by the title track, a pithy and infectiously catchy nod to the enduring power of music. The strings on Don’t Stop Singing were arranged and led by gifted young Scottish musician Donald Grant, who featured to great acclaim last year on Kate Rusby’s Make The Light album. Other guests on a truly generation-transcending album include Benji Kirkpatrick from Bellowhead and his legendary acordion playing father John Kirkpatrick, who himself featured on Sandy. It’s been an affecting journey for Thea, who grew up both geographically and spiritually close to Sandy and the Fairport’s world. It’s also a piece of work she feels deeply proud of. Don’t Stop Singing is an unprecedented meeting of musical minds. And also a work of spine-tingling beauty.